Directions from Evansville and points West - Call 812-936-7656 if lost. Please note: The main gate closes at 10:00 PM Eastern (9:00 Central) and opens at 9:00 AM Eastern during Our Haven sponsored events. Please arrange your travel iteniary to arrive before the gate closes. Pre-registered participants: please notify Our Haven if you require alternative arrangments such as arriving outside these hours. For Non Our Haven sponsored events, please arrange with the festival coordinators for gate hours. French Lick is less than a half-day's journey from most Midwestern cities. Please note: the speed limits in French Lick and West Baden are strictly enforced. Please note, it is strongly suggested to not follow a GPS for directions to Our Haven, at least on your first visit. Directions given by a GPS can, and often times will, take you along back roads that wander endlessly. From I-64, take exit 79 (IN-37) north into French Lick, IN. (most direct route). Take IN-56 S through French Lick, IN. Please watch your speed through West Baden and French Lick. Speed limits are strictly enforced in town. Approx. 6 miles west of downtown French Lick is North Hillham Road (may be listed as N Nillham Rd NW). Turn RIGHT onto North Hillham Road. North Hillham Road is the first right-hand turn after the used car lot on your right. If you pass Nicholson's Market, you have gone too far. Take the 2nd right on North West Hillham Road (about 2 miles out) on to Spencer Hollow Road. (Google/GPS labels this road Emmons Ridge/Newland Road). There will be a road sign near a tree on the right before you make the turn. If you reach a turkey farm, you have gone too far. The hill with this sign is also the best place to get cellular phone signal while at Our Haven. Spencer Hollow Road becomes a gravel road. 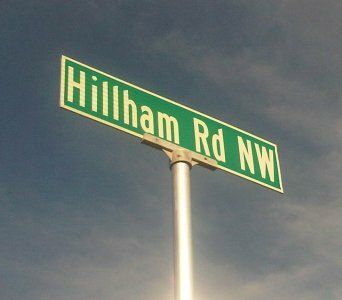 Please note: the road name will change from Hillham Road to Rusk Road. About a mile down Spencer Hollow Road on the left is our turn in. Look for a sign on the left like the one below off the road about 100 feet.